A mini campaign using the Warhammer Great War rules to resolve combat, as Germany and Russia fight over Poland at the start of The Great War prior to things getting too bogged down in static positions. Paul, Tel and Matt as the Honourable Prussians verses the Barbaric Russians of Mark and Tony. The day is twelve map turns\hours long, with up to 10 battle turns per hour. Typical nodal movement but on an asymmetric map which makes map traversal and selection of defensive positions more interesting. There is a 50% chance after battle that each individual removed will return to their unit. The first fight of the day was between two cavalry squadrons, each of two troops. 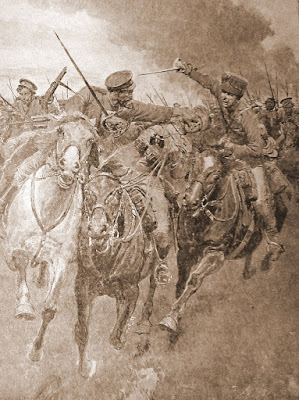 The German cavalry had previously encountered an infantry force taking an off-road southern route and had attempted to go round them, only to run into an equal force of Russians; both decided to attack. The German held their ground and used from their carbines to whittle away at one of the Russian troops, which in return charged in but with little effect. The resultant melee saw the Russians removed from the field. The remaining troop suffered a similar fate, being fired upon by one troop as the other troop charged in after making a good elan roll to get the bonus movement necessary to make contact. The Germans pursued the Russians all the way to Bridge C which was shown to be defended by at least a company of Russian infantry. The big battle of the day was to occur just to the east of Lickspitl, as a large German force assaulted a company of Russians supported by dug in artillery and machine guns. The Russians came off worse in the artillery duel despite getting in the first salvo. Now badly outnumbered and facing a pounding from the German 77mm artillery the Russians decided to retreat off the field, and in the next couple of hours marched through Lockjaw towards Bridge C, with the Germans close behind. The day is over half way through and both sides have forces approaching opposing bridges. The campaign should, with luck, be completed next week.